Magic Dice - Best Steem dApp? I saw new post from @magicdice about new MAGIC token. [READ POST] Every player will get part of @magicdice's profit, amount will be based on number of MAGIC token. 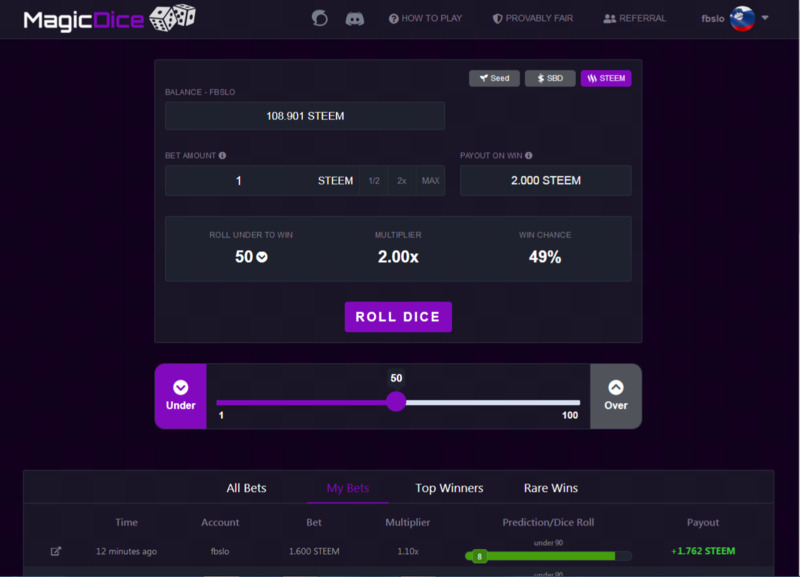 Why I believe that MagicDice.com is one of best dApps build on Steem? They don't use reward pool to fund development. They have MAGIC tokens (For every STEEM wagered you will receive 200 MAGIC tokens). They had over 8,900,000 STEEM and 25,000 SBD wagered on their dice game in last 30 days. If you haven't tried the game yet, go to https://magic-dice.com and give it a try. If you want more information about Magic Dice, read their introduction post. Many users made thousands of STEEM! Buy you can also lose your money! You can see how it looks. If you reside in a location where gambling over the internet is illegal, please do not click on anything related to these activities. You must be at least 18 years of age to click on any betting or gambling related items even if it is legal to do so in your location. Recognizing that the laws and regulations involving online gaming are different everywhere, readers are advised to check with the laws that exist within their own jurisdiction to ascertain the legality of the activities which are covered. The games provided by Magic Dice are based on blockchain, fair and transparent. When you start playing these games, please note that online gambling is an entertainment vehicle and that it carries with it a certain degree of financial risk. Players should be aware of this risk, and govern themselves accordingly.